SAILKARMA.COM - Sailing News, Videos and Photos! 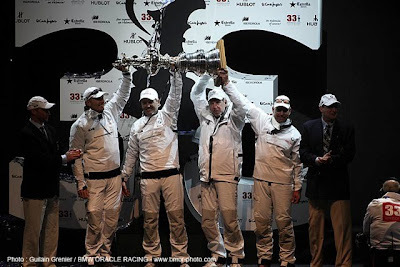 : Ellison's goal to market the America's Cup to the U.S.
Why was Russell Coutts, perhaps the world's most accomplished professional sailor, a manager rather than a skipper in your victorious pursuit of the America's Cup? (Coutts) is an extraordinary engineering manager. This is a big operation. It's 150 people. Fifty design engineers. Russell himself is a design engineer. Putting a team of this quality together, the credit goes to Russell. The first guy I hired was Jimmy (Spithill). Jimmy was offered the job of driving for Alinghi [the Swiss-owned defender of the 2010 America's Cup]. Russell convinced him that he should come with our team even though he knew that the only team that he might not get a chance to drive for was Russell Coutts's team. But Jimmy decided he'd rather be No. 2 behind Russell Coutts than No. 1 at any other team. As it turned out, Jimmy put in all the hard work and Russell gave him the driving gloves and let him drive the boat, and he did a great job. This is just like business, isn't it? What I didn't realize when I went from amateur sailing -- I drove my boat Sayonara to five consecutive world championships; I thought, oh, I must be good at this sailing thing -- and then I turned pro, and I drove in the Louis Vuitton Cup and I'd been sailing in pro match racing for a while -- that there's just a gigantic difference between professional sports and amateur sports. I found that professional sports resembles Oracle (ORCL, Fortune 500) much more than my experience with Sayonara. In America's Cup sailing we have a large engineering team, recruiting is crucial, planning is crucial, leadership is crucial, the level of effort and the level of commitment that's required to be successful, the focus, it really is a full-time job. 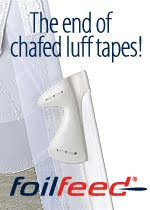 Have you signed contracts with Coutts and Spithill for your defense of the America's Cup? Well, we haven't signed anybody. But I'm confident. We all get along. I think we all have the same vision for the 34th America's Cup and indeed for the America's Cup in general that I'd be stunned if this team broke up. Not only will we keep Jimmy and keep Russell, our team will be even stronger going into the 34th. Can you actually make money with an America's Cup team? That's one of the things that's crucial for the 34th is that we make this a profitable venture for all the teams, not just for the defender or the challenger of record. We'd make it a more attractive TV sport so we can sell TV contracts. We'll get the budgets under control so someone can come in and campaign for three, four, five million dollars. So the South Africans will come back. The Swedes will come back, not that they can't raise more money, but we'd want someone with a smaller budget to be able to build their boat, put together their team and be competitive. We'd like this to not be a matter of who invests the most money in designing their boat but who sails the best. But you're the guy with the resources and who has shown the willingness to spend them. So you're willing to make it so that people who spend only $5 million can compete with you? You bet. If you look at the kind of sailing I've been doing lately, I'm sailing RC 44s. Last year I was on the international circuit, sailing RC 44s. What is that circuit? Every boat is exactly the same. Everyone's got the same boat. Everyone's got the same sails. I love that circuit, and it's all professional. The guy who won it last year was Jimmy Spithill, driving for one team, and I was second, with Russell as tactician. I was driving Russell's boat. I love that kind of sailing. And I think we'll do very well in an America's Cup where sailing skill is at a premium. Now, I don't want to turn America's Cup into one-design sailing, which is too much of a break with tradition. There should be some engineering aspects. But the engineering aspects should not be dominant or, as my legal friends say, should not be dispositive: I've got the fastest boat, therefore I win. I want it to be a combination, where you've got a little bit of an edge with a slightly faster boat. But in the end it's got to come down to how good is your sailing team and how do you sail and how well do you call the wind and how good are your tactics and how well do you trim and how well did you drive. Won't the size of your team alone make it impossible to keep to $5 million? No. You wouldn't need 50 design engineers, obviously, if you had smaller boats, and if the design rule wasn't so flexible, if you limited how much of an engineering advantage you'd get. If the boats are smaller they're much cheaper to build. The sails aren't so expensive. The sails on these big boats cost half a million dollars. One sail. So you're committed to rules that will lower the bar? Oh yeah. It shouldn't be about money. It should be a little bit about technology and a lot about sailing. And it's got to be a great experience for viewers. It's got to be something kids want to watch. Quite frankly when I'm watching the Olympics I watch downhill racing. My kids watch the snowboarders. Okay. We've got to pay attention to that. I kind of like monohulls. All my racing experience is on monohulls. But if what the kids want to watch is multihulls because it's more exciting, we'll go multihulls. We've got to make this a great sport from the point of view of the participant, especially the kid who's just getting into the sport, and from the point of view of the viewer on television. Have you approached the networks yet? I know Rupert Murdoch, but I'm not going to approach him about Fox. Though they would be great. I know Bog Iger and I'm not going to approach him about ESPN. But that's what we want. We want network coverage. We want ESPN coverage. We think we can make this extremely attractive and comprehensible. We want some 15-year-old watching this thing, saying, "Wow, that's cool. I'd love to do that." What other marketing ideas do you have? It's got to be a commercially viable sport. Baseball is. Football is. Tennis is. We've got to attract a fan base. We have to make it interesting. We have to have interesting commentators. When the NFL put in that yellow first down line on the field, it gave the fan a little more insight as to what was going on during the play. We can provide that computer assistance, which is especially needed in sailing. Have you met people who can do this? Oh yeah. The guy who did the yellow line is named Stan Honey. I've sailed with him. He lives in the North Bay. He was my navigator in my first-ever trans-Pacific yacht race in the Sayonara. So we know the people who really understand the computer technology that does that. We think it's a huge opportunity for our sport. Are you comfortable predicting the next America's Cup winner will not be due to a technological edge? No. You never know. It's okay to be about clever, so long as it's not about money. In the Australian challenge when John Bertrand came over here [in 1983] and sailed the winged keel, that was not an expensive deal. It was just a clever piece of engineering. So I have no problem with clever, occasionally moving the America's Cup from one place to another. That is the America's Cup. What I have a problem with are budgets that are so high that most teams can't participate, because we want to have a broad base of teams come in here and compete for the America's Cup and have a reasonable chance of winning. I also have a problem with technology always being the determining factor as opposed to sailing skill. So maybe once every 10 America's Cups someone comes up with something really innovative and wins because of technology. The other nine it's about who sails better. So just by the law of probability you're decreasing your chances of winning. You bet. That's okay. All we care about is if we duly lose that we get a fair chance to win it back next time. That's all we want. We don't want to ever have to go to court again to get a fair set of rules. Where's the American audience today compared with where it's going to be for the next America's Cup? We've talked with Louis Vuitton [sponsor of the Louis Vuitton Cup, which in the past has determined the right to challenge for the America's Cup] about sponsoring with the older boats, the Class V boats, a circuit, where we do a race in Hong Kong, New Zealand, Italy, France, in Newport, San Francisco, six or seven races, and getting the existing teams back, with America's Cup-class boats. It would be like the Premier soccer league in the U.K. with the occasional World Cup. Every fourth year there's the America's Cup. But you have all these teams playing soccer against each other in the intervening years until all of a sudden everything stops for three months and you have this America's Cup. What about the U.S. audience? No sport can be successful without good TV coverage. The TV coverage of the America's Cup has been dismal in the United States. We can fix that easily. With a little bit of technology and care and attention I think we can make this incredibly exciting to kids. The sailors watch. But we've got to go beyond that. We've got to get the next generation interested.